The trouble with lovely home-made things is that you taste them once, and never want shop-bought again. This is why I steadfastly refuse to buy cake from the supermarket (aside from malt loaf - which is for the child). And now, I'm either never eating pesto again or will always be making my own. Today's tea required the use of two recipes - one for the home made pesto to use up the basil that's been fragrancing my fridge for the past week, the other to make use of said pesto. 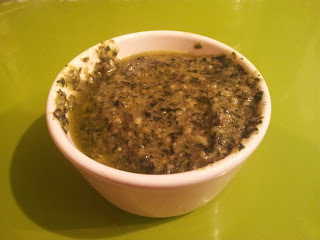 Just blitzing the pesto ingredients in the food processor was enough to have me drooling everywhere. 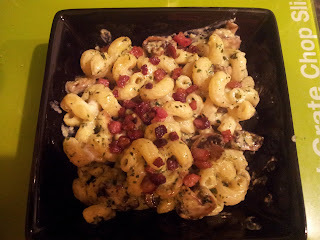 But mixed with crispy pancetta, mushrooms and pasta, the pesto took the second recipe to a whole other level. You could actually taste the pine nuts, garlic and olive oil in the pesto, despite the saltiness of the pancetta and the milky creme fraiche. That said, recently I was horrified to discover that most shop-bought jar-stored pesto is mostly made of cashew nuts rather than pine nuts. I'm guessing this is for values-sake rather than taste or shelf-life. Of course, home-made is far more expensive, but I shall definitely be making sure the husband doesn't over-water my basil plant next summer! Recipes can be found courtesy of BBC Food here and BBC Good Food here. Really must bother to get a decent camera organised as the pesto looks far more pleasingly green in real life - although the presentation of my pasta dish would look just as bad whatever the camera.